At Holy Communion on Sundays at 10 a.m. children meet in the Church Rooms and then join the worship at the Peace. Saturday afternoon 4pm-6pm – crafts & activities, worship, meal with drinks. Children 10—14 years – come and enjoy a meal, make friends, make a difference, make up fun games together – begins at 5.00pm to 7.00pm and runs fortnightly. It takes place in St Laurence’s Church Rooms. Our vision is that the club will help us to make friends, and together, have fun, whilst learning and helping with the Christian mission of caring for our world and for other people. 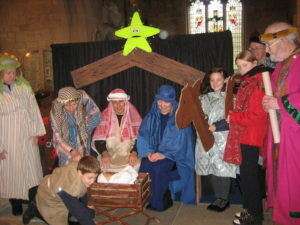 Jo works with local schools and leads the Open The Book team taking Bible stories into schools. Here they are in December 18 at Hackness. If you want to know about how we are working with children or for more info about any of the above use the Contact Us link or contact Jo Charlesworth, our Children`s Worker on 360123 or 07786003025 or email jojohncharles@gmail.com.